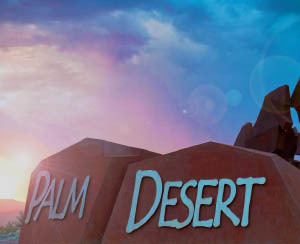 Palm Desert is one of the most prolific golf communities in the world. This beautiful city is nestled in a central location within the Coachella Valley that borders Rancho Mirage, Cathedral City, La Quinta and Indian Wells. As a well-known designation for golf tourists, golf tournaments and golf enthusiast, Palm Desert is truly a golfer’s dream location. Palm Desert has some of the best options for homes in gated golf course communities in the Desert with great options for most price ranges from the affordable to the ultra-high-end luxury. If you are interested in finding the perfect home in a golf course community Palm Desert provides a central location conveniently close to shopping, parks, schools, colleges and restaurants. Bighorn Golf Club is located on a breathtaking drive through sun-kissed canyons of the Palms to Pines Highway. The undulating rock formations leads to this exclusive desert retreat that is unlike any other. This private escape is home to some of the finest architecture and elaborate houses in the Desert. This highly sought after community located just North of the I-10 Freeway on Washington Street is a prime example of a Del Webb masterpiece. This with approx. 5,000 homes Master-Planned community offers residents 55+ quality homes with truly outstanding amenities within a close-knit community of like-minded individuals. This spectacular community offers two 18-hole golf courses, 3 clubhouses, a fishing lake, indoor and outdoor pools, tennis courts, bocce courts, putting course, tons of hobby clubs and just too much to list here – all this with a low HOA fee! If you are looking for a home or income property that truly lives up to hype look no further that Sun City PD! Most homes in this community are priced between $290,000 to $450,000, but only a few select homes can have sold for over $900,000.